This blog post was lovingly written by our good friend Danielle Euker, local teacher and mom extraordinaire to four terrific kids! I have always loved food. LOVED. I will try anything, the more bizarre the better, just so I can say I tried it… But I have not been so ready to jump in and do the adventurous cooking routine. I like to cook safe, tried and true recipes and I was always a strict measurement kinda gal. Cue side story I have known Nimali (the fantabulous Dr. Yum) for over ten years and trust her with something even more important than my life – the lives of my four children. So when she started the Dr. Yum Project I was so excited and could not wait to see what this project would do not just for the community but for our family as well. As a teacher, I began making a couple of Dr. Yum’s first recipes with my students and they were amazing hits. Next thing you know, my daughter Moira began helping Nimali and Jen Miller around the Dr. Yum kitchen, and I took some classes myself. With Moira and I both ready to invest in the food choices we make, not just for ourselves but for our whole family, we have changed our view of cooking and eating. We do not look at food as a chore, but as a fun way to try new things, to laugh, gag and then laugh some more as we try to tweak and improve upon our less-then-perfect goofs and dance around the kitchen at our successes and embrace our inner-YUM-ness. Recently we joined the amazing folks at Pitayo and Snead’s farm for the First Annual Watermelon Workout. Not only did it kick our tails but we also came home with some AMAZING 20+ pound watermelons. After making the amazing watermelon water and the container of slices to grab and go, we kind of wondered what next? 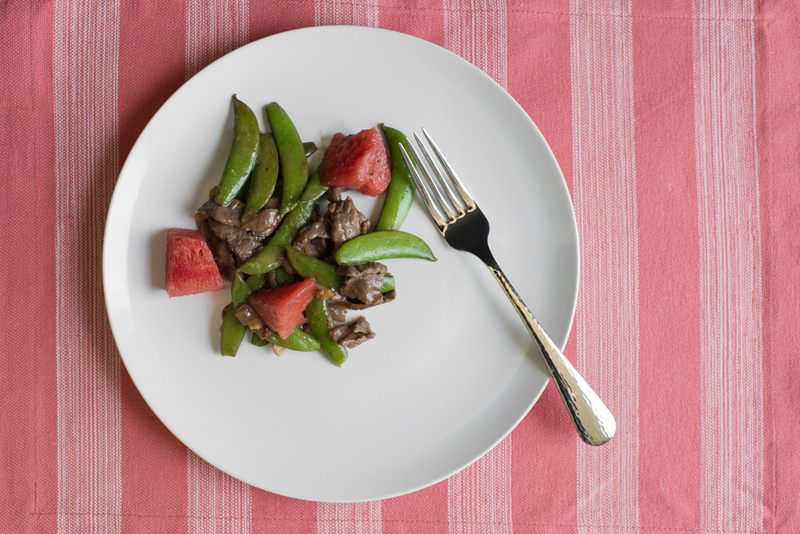 While I was doing some work at school Moira sent me a recipe for a beef stir fry that featured watermelon. EW. I mean seriously, ew. But we have been YUM-ified at the Euker household so meh, I decided we would make it for dinner. Wow. This last part is hard to write. I am not thankful for meeting Nimali and Jen; thankful is such a simple word that does not come close to the warmth in my heart. I am blessed and indebted to these wonderful women and all involved with the Dr. Yum Project. I never would have tried this recipe before, but I did a few weeks ago and I am so happy I did!! 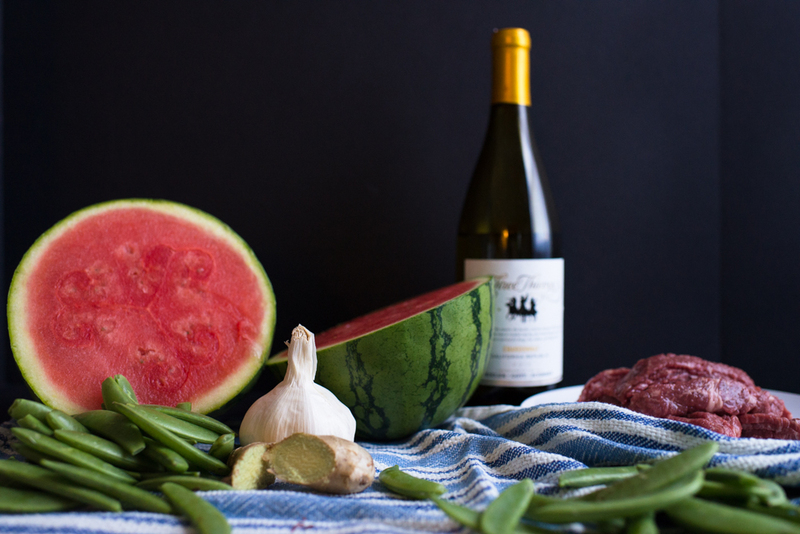 This makes an amazing dinner: The watermelon gives such an amazing zip that was totally unexpected. I encourage you to not just try this recipe but to make it your own. I followed the following ingredients but also added kimichi (Korean cabbage that is spicy and sweet, high in fiber, very low in calorie), mushrooms, and extra garlic. Toss together first 6 ingredients and 1 tablespoon wine. Let stand 30 minutes. Meanwhile, stir together hot water, hoisin, and remaining 1 tablespoon wine. 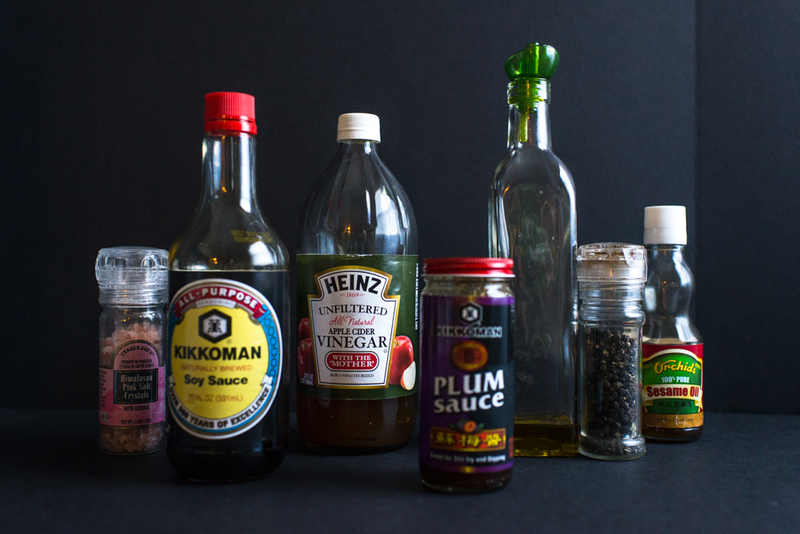 Remove beef from marinade, discarding marinade. Sprinkle with salt and black pepper; cook half of beef in 1 1/2 teaspoon hot coconut oil in a large skillet over high heat, without stirring, 45 seconds or until browned; turn beef, and cook 30 seconds or until browned. Transfer to a warm plate. Repeat with remaining 1 1/2 teaspoon oil and beef. Stir-fry onion in remaining 1 tablespoon hot canola oil in skillet over medium-high heat 2 minutes or until tender. Add sugar snap peas, ginger, and crushed red pepper; stir-fry 2 minutes. Add beef and hoisin mixture; stir-fry 1 minute or until slightly thickened. Remove from heat. Stir in watermelon. Add salt, black pepper, and red pepper to taste. Serve immediately with hot cooked rice.